Stand 5 - View Down Guilder Lane From Greencroft Street. One possible explanation of the meaning of the name Guilder Lane is that it is derived from ‘Guilds’. These were societies formed by mediaeval craftsmen, such as stonemasons, for mutual assistance, job protection and collective wage bargaining – an early form of trades union. Another explanation is that it’s a variation on ‘gilds’, suggesting that it was a street of decorative metal workers. Either way, it’s believed that Guilder Lane housed mediaeval craftsmen. The first seven houses on your right survive from this period, dating from circa 1450. One of these has part of its wall open to view, showing the original ‘wattle and daub’ construction. This involved a ‘skeleton of wattle’ – interwoven from flexible trees like the willow and a filling and coating of mud mixed with lime and cow dung. In 1901, over thirty families lived in this small street. They ranged from those who were quite prosperous to those who probably had to count every penny. It must have been a very mixed and lively community. And between them they had FORTY-NINE children, between the ages of four and fourteen. Like most small streets before the automobile, Guilder Lane was an unofficial playground most evenings and weekends. There were sometimes ‘territorial’ disputes with The Greencroft Street children.We can imagine what the noise and activity must have been like. The Guilder Lane was still a playground within many of our interviewees’ living memory. 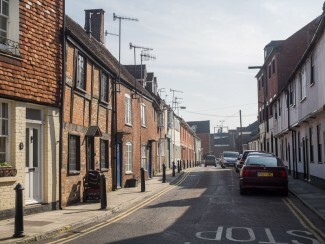 The large corn mill on the right hand side (now Salisbury Printing) would have generated a fair amount of mess in the street outside, e.g. when flour was loaded on to wagons. Opposite the mill you can see the cobbled entrance to No. 13 Guilder Lane. This is usually a giveaway that the premises had something to do with horses. Concentrated on a small stretch of pavement, their iron-shod hooves would have created havoc, hence the strengthening of the entrance. 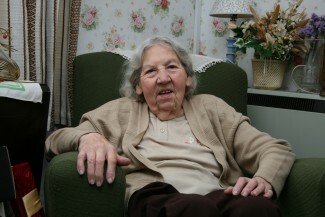 Phyllis was our oldest oral history interviewee, born in 1919. She moved to Guilder Lane from Rampart Road in the mid 1940s. She told us what her home was like when she first moved in. Listen to Phyllis’ audio clip at the right of the page or on your downloaded MP3 file from the Downloads page. When the Ring Road was built, Phyllis, and her husband lost a substantial amount of garden and they were no longer able to keep chickens. She told us: ‘They took ‘alf my garden and my lovely apple tree, they took an’ all my gooseberry bushes , an’ I had twenty seven pound for that’. Walk to the end of Guilder lane until you get to the junction of Milford Street.